A drama set in the super glitzy but pressurized world of cut-throat high finance, Arbitrage explores the art of white collar money-making where ethics take a back seat and the bottom line is the only line that matters. In New York City, respected business tycoon Robert Miller (Richard Gere) is turning 60 and desperate to close a deal to sell his family-owned private investment firm for a handsome profit. Robert is hiding a $400 million hole in the company's books due to a copper mine investment opportunity gone terribly wrong. He is also carrying on an affair with art gallery employee Julie Cote (Laetitia Casta) behind the back of his wife Ellen (Susan Sarandon). With the deal taking longer than expected to close, Robert's daughter and the firm's chief financial officer Brooke (Brit Marling) uncovers evidence suggesting the books are cooked. Then Julie is killed in a late night car accident on a remote road after Robert dozes off behind the wheel. Robert flees the scene of the accident with the help of Jimmy Grant (Nate Parker), a young man from Harlem and the son of Robert's former loyal employee. But police detective Bryer (Tim Roth) starts to suspect Robert had something to do with Julie's death, jeopardizing everything Robert has worked for. A slick independent production written and directed by Nicholas Jarecki, Arbitrage is a compact and fast-moving business drama. The film focuses purely on the character of Robert Miller, and adopts both his strengths and weaknesses: smooth, determined, and magnetic, Miller is also soulless. ruthless and cold. Jarecki ensures that Arbitrage makes for compelling viewing as an insider's look into the world of the very rich where money governs, arrogance dictates, and rules are for others. Jarecki succeeds in making his loathsome main character somewhat sympathetic. 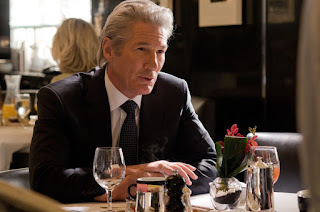 Thanks to an effortlessly fluid Richard Gere performance, Robert Miller emerges as a charismatic and radiant man who immediately dominates every room he enters. He is also a liar, a fraudster and a philanderer, and attempts to cover up his role in a fatal accident by pressuring an innocent man into taking the fall. At this level of wealth the package is inseparable, and since Miller and his ilk effectively control the levers of finance, he is a character at least worth understanding. The film's limitation as a drama reside in the lack of character development. The narrative is unapologetic in zooming in on an unscrupulous man facing multiple concurrent crises in one week. While damage will be caused and a price paid as Robert looks for the wriggle room needed to survive, there is no space in Arbitrage for growth or reflection. Indeed, the scenes where Miller tangles with his daughter Brooke and his wife Ellen are the weakest. Jarecki is more comfortable portraying Miller in his element manipulating the business environment rather than grappling with the human consequences. Stylistically Arbitrage oozes power and wealth, the film capturing the glittering world of expensive homes, lavish parties, and snooty art galleries and fund raisers. The one percent live the life, but it's a life where the heart can also grow awfully cold.